No longer the exclusive domain of teenaged boys, nearly 60% of Americans play video games and consumers spent nearly $22 billion on video games and related accessories in 2013, according to a report from the Entertainment Software Association. Reflecting this trend, there are now a relatively small yet passionate number of behavioral health professionals who are either studying the role of video games in therapy or integrating games into their practices. The amount of academic literature on video games in psychotherapy is limited, but much of it indicates the potential of games to generate positive clinical outcomes. Perhaps the major benefit of games is that they help players expand their social support networks and engage with diverse groups of people. But other games help develop players' motivation and persistence in the face of failure by requiring them to advance through levels of a game, achieve goals, and overcome obstacles. The virtual environment of video games may also give players a safe place to practice the regulation of negative emotions such as anger, anxiety, frustration, and sadness. Game players can work on problems or try new experiences in the virtual world before attempts are made in the real world. 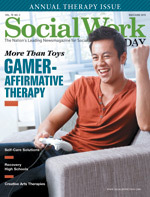 Despite the potential benefits of gaming as a therapeutic tool, there is resistance from social workers and other behavioral health professionals to integrate these methods into practice for the same reasons that social workers have been reluctant to adopt technologically oriented tools into practice in other areas. Change is hard and social workers are hard-wired into "relationship-oriented" interactions. Technology has been a hard sell for social workers over the years, but times are changing and hopefully the changes will extend to the use of gaming as a therapeutic tool as there is much to gain.